My kingdom for a tournament bid. Win 9 regular season games. Believe me when I tell you, this will be a tall task. With the offense more than likely taking a step back next year, the defense will have to make a miracle recovery for this to happen. Looking at the schedule I’m only counting five probable wins. With road games against UGA, Mizzou, TAMU, and Tennessee, and home dates against LSU, Florida and Clemson, I’m not sure where we’ll find the other four. Win those five gimmes and go 4-3 against the rest (with a win over Clemson) and we’ve got ourselves a spectacularly successful season. Triple the 2014 sack total. Maybe an overreach, but our total of 12 sacks in 2014 was astoundingly low. Tripling our total would still only tie us for second in sacks in the SEC this past year. Doubling our total would only give us a tie for 9th in the league, so I’m shooting for the stars while keeping my feet on the ground. Learn how to tackle. In the game of tackle football this is an essential skill to have, so we need to develop it. We had two players in the top 30 in tackles in the SEC this year – Skai Moore at 13 and T.J. Gurley at 15. Georgia, Missouri and Tennessee each had two players in the top 10. We need Moore and the fast-rising Jonathan Walton to be tackling machines next year and both finish in the top 10. Hold opponents to less than 25 points per game and less than 175 rush yards per game. Reasonable, achievable, and necessary. This would likely move us into the top 10 in the league in both categories. Develop a starting QB not named Pharoh Cooper. You all know we love Pharoh Cooper, but please stop floating the idea that he might be our starting QB next year. He will be the leading returning receiver in the SEC, and we need him at that position so bad it hurts. We need him there much more than we need him to be a full-time wildcat quarterback with bad mechanics and a below average throwing arm. Connor Mitch, we’re looking at you. Find a complement to Cooper at WR. Nick Jones and Shaq Roland will be gone, leaving little-used K.J. Brent and Shamier Jeffery as the leading returning wide receivers next to Cooper. One of those guys needs to emerge, along with at least one of our redshirted freshmen – Shaq Davidson, Deebo Samuel or Terry Googer. Return a kickoff for touchdown. If Shon Carson comes back and is still our primary returner, scratch this one. Make a postseason tournament. At the beginning of the season the NIT seemed a reasonable goal. Two missteps in Charleston made us all wonder if even that was attainable. But the proverbial light seems to have come on for this team after the destruction of two pretty decent teams in Oklahoma State and Clemson. Now maybe an NCAA tournament birth is not so far out of reach after all? 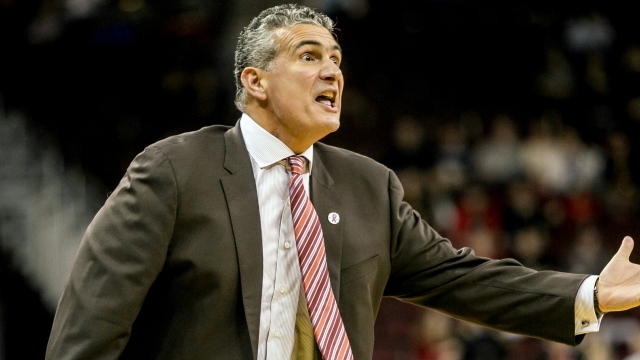 It will still be an uphill climb for Frank Martin’s bunch. If they can keep playing at the level they have been playing, and Sindarius Thornwell starts playing like we know he can, they should finish somewhere between third and fifth in the SEC. Anything below third probably makes them a bubble team. But wouldn’t it be nice to watch on selection Sunday with a chance to play in the dance? Put a player on the All-SEC first or second team. Second team is much more likely. The leading candidate right now? I think we all know it’s Duane Notice. Who had that in the betting pool in October? Final Four. Dawn Staley said it, the players have bought into it, so let’s do it. I certainly think we’re one of the top four teams in the country, but it will be interesting to see how our young players hold up to the SEC grind. Super Regional. The honeymoon is over for Chad Holbrook, and it’s time for the baseball team to take a step forward instead of another step back. If there is one area of South Carolina athletics where “good enough” is not good enough, it’s baseball. Holbrook is a great guy, and by all accounts a fantastic baseball man. But the shocking Regional loss to Maryland last year at home has stuck in the craw of Gamecock fans all offseason, and another exit like that could get the natives grumbling. The preseason rankings don’t bode well for the Gamecocks (I’ve seen 21 in one poll), but we all know rankings are garbage at this stage. The talent is there to make a run if we can stay healthy, and we need to win back some of that CWS good will before Vanderbilt takes it all. How about you, what would you like to see in 2015? Agree with all you wrote. Would love to see us beat Clemson in every sport possible. Would love to see Clemson come into Williams-Brice riding their cupcake schedule and see us knock them off. Would love to beat LSU for the first time in many years. Would love to beat UGA in Athens. Would love to beat Tennessee in every sport possible. Agree on the basketball teams. The women look dominating. The baseball team must improve. The loss to Maryland just left me saying, “Oh well. We had a good run but its over. At least we have football.” Now I am saying, “Of well. We had a good run but its over. At least we have baseball.” But the baseball team is a mystery to me. Could be good but I suspect they will be above average but better than the football program. Finally, I would love to see us land a top 5 recruiting class in football. Not going to happen but I am watching Clemson bound us on the football field and in recruiting right now.